We take road trips down South from time to time when visiting friends who live in the region. More often, I get on the bus to Les Halles on Cours Lafayette and go there on a journey of a more spiritual kind. I was first astounded by the sheer beauty, direct honest flavor and silken texture of this goat cheese when it cost about half of what it does now. A couple of years ago, the Cathare won a gold medal at the Concours Général Agricole du Salon de l'Agriculture in Paris. Since then, the price has increased dramatically in Lyon, but remains at about a third of its big city price if purchased directly from the farm. Even now when we are putting together a good cheese plate, I do what it takes to shell out the cash for one of these babies, because not only is it a beautiful cheese, the flavor makes it worth every penny. The Cathare is produced at La Ferme de Cabriole in a little hamlet called Robinhole in the Languedoc region near Toulouse, a farm that not only produces cow and goat milk cheeses and yogurt, but also sells farm raised bovine meats and a variety of syrups, fruit pastes and confitures made from plants growing on the farm. The cheese is produced from their herd of about 120 Saanen goats that spend 8-10 months out of the year grazing in the open pastures surrounding the farm, with their diet supplemented by pea shoots and stems, hay, alfalfa, oats, corn, and sunflower seeds in inclement weather. The goats produce milk 10 months out of the year, starting in Autumn. Their daily milkings produce 2.5 to 5 liters of milk per day. 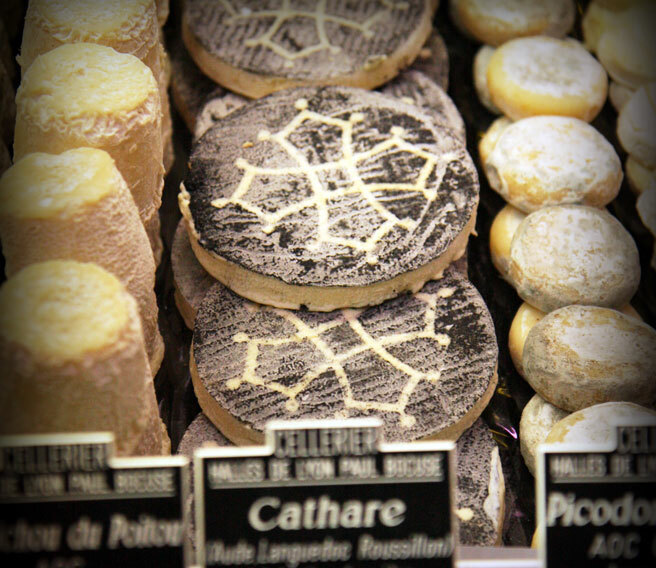 An unpasturized goat cheese, the Cathare is a fragile, soft, almost liquid cheese when at its peak. Delicate handling is required to avoid marring the stenciled top layer made of ashes, a common coating for raw goat milk cheeses. It doesn't travel well, nor is it legal to import into the States, due to it not having been aged the requisite 60 days imposed by US customs. It is best enjoyed during your visit to France. The name from this cheese comes from a religious movement with its roots in 11th century Occitaine, although the cheese itself is relatively new on our cheese horizon, dating back only to 1995. Its stylized Occitan cross creates a strong visual print, a striking prediction of the distinctive, frank and bold flavor to come. When you see this cheese, do not hesitate to give it a try. Ah, as we have a home in the Languedoc, what is the name of the farm and in what town? It sounds wonderful. We would love to visit. Cindy! Go there! The name of the farm is in the post. I know the next time I am through there I will be knocking on their door. They have pre-scheduled visits and their website says they are looking for someone to work on the farm. A stage there would be a great opportunity for any young cheese maker. Don't you think? This cheese looks amazing. Thanks for the tip Lucy - although I don't think I will make it to the farm anytime soon I am always on the lookout for new cheeses. Love, love reading in the comfort of my bed. It's just too cold hearted to read from the computer for any length of time. Oh to have your blog (with pictures) in book form to read in bed or under my "twisted willow" on this perfect summers day. Thanks again Lucy for sharing, the pictures, the smells, sounds and tastes of your life. 'm going to be looking for this one. I love goat cheeses! OMG the cheeses look amazing!! Oh how I envy you! One more thing, how did last year's Vin de Noix turn out? I am been waiting for you to post the results but no word. Hope to hear about it soon.